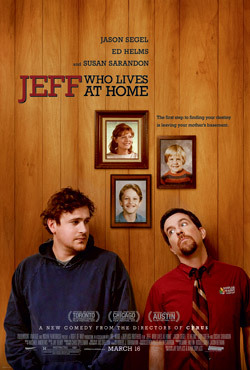 Jeff, Who Lives at Home Movie Trailer. Jason Segel, Ed Helms and Susan Sarandon star in the indie dramedy. See the movie trailer and photos for Jeff, Who Lives at Home. Dispatched from his basement room on an errand for his mother, slacker Jeff (Segel) might finally discover his destiny when he spends the day with his brother Pat (Helms) as he tracks his possibly adulterous wife (Judy Greer). MPAA Rating: (R) for language including sexual references and some drug use.